Much has been made in the media of Biffy Clyro’s new album Opposites. For the months leading up to the release there have been interviews, “exclusives”, two tracks released, and Radio gigs to promote it. But also not least the excitement felt from the fans in the wait for it to be with us. It arrived last Monday morning and I have played it pretty much all the time since. During the week I also discovered that there are two versions of the album; the “deluxe edition” which is the only version I thought existed (certainly how the band described it in all interviews) and a shorter, re-ordered single disc version which apparently the record label wanted to release. More on that later. This review deals with the album as intended by the band – the two disc “opposites” of each other. I remember reading that disc one is darker, brooding, looking back at how life has changed, strains on relationships, and everything which has happened to get to the point at which they are now. The second disc is the uplifting look to the future and opportunities which await. When listening to the music the tone and mood is clear. There is much anger and pure rock out moments and there is the anthemic choruses and joy that Biffy seem to have discovered in their most recent releases. From the slow building start of opening track ‘Different People’, to the signature dissonant guitar and harmony vocals which introduce ‘Black Chandelier‘ you know you have a Biffy album invading your ears. On first listen through of the album there was nothing which I did not like, no “oh this’ll take a few listens” moment. In fact it felt as if I’d owned this album for a very long time and was loving hearing it. Don’t misunderstand that as an “I’ve it heard it all before” comment, it isn’t. What we have here is perhaps their strongest album to date and there is still progression and growth within the confines of their signature sound. 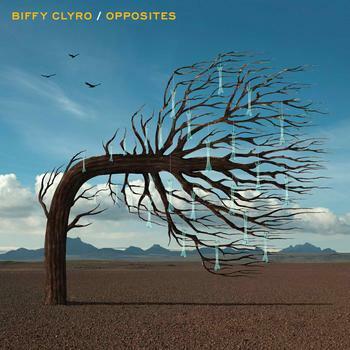 To put it another way; Opposites sounds as you’d want a Biffy album to. The album doesn’t let up, and whilst there are some slow tracks – such as the brilliant title track, ‘Opposites’ – in the main its full speed ahead. ‘Biblical’, ‘Modern Magical Formula’, ‘Stinging Bell’, and ‘Pocket’ all jump out during initial listens. The experiences the band have gone through, the stratospheric fame (and its tolls), headlining of major festivals, perfect support slots, everything which has happened in the past few years has culminated into this album. It is a huge in sound, in number of tracks, and in introspection and outlook. On the subject of number of tracks, Opposites was originally announced as a pair of albums: The Land at the End of Our Toes and The Sand at the Core of Our Bones, these titles are now the names of the individual discs. And of course this reference doesn’t feature at all on the single disc version. Maybe I’m getting a bee in my bonnet over the fact that there are two versions of the album. But to me it seems a perfect example of how out of touch record labels appear to be these days. It is well documented that labels are struggling to connect with their customers nowadays, and pulling a stunt such as releasing an alternative single disc version of a new album (not just the first disc, but a completely re-arranged track list) takes the biscuit. Why do it? Because the two disc at £2 more would be too expensive, or in the era of single-track downloads the youth of today don’t have the attention span to listen past 14 tracks? Do they not remember that virtually all the great bands of the day made that perfect double album? Do they not remember the glee and anticipation that a forthcoming double album from a favourite band would unleash? Physical Graffiti, The Wall, The White Album, Quadrophenia, Mellon Collie and Infinite Sadness, The Fragile…the list goes on. Why would a record label neuter such a moment of glory? Yet, ironically as much as there are some classic double albums out there, there are so many which go off the rails, wallowing in the bloated self-belief of “can do no wrong”. Some would argue the likes of Guns N’ Roses’ Use Your Illusion albums are the perfect example. Perhaps this is what the label feared and attempted to save them from themselves? It is my view that Opposites does not fall into the later category. Biffy Clyro are the kind of traditional band who still want to make a double-album, and importantly are the British band of the moment who are more than capable to pull it off. As I write this I’m hearing that the album went straight in at number one in the UK charts – their first number one album ever . 2013 is going to be a huge year for Biffy Clyro and a perfect album to take on that journey with them.